Lost Parking Spaces in Underground Parking Garage Due to Drain Back-Up More than an Inconvenience. Let’s think about the real impact of taking a few parking stalls out of circulation due to a drain back-up in your underground garage. EdenFlo offers the best drain cleaning solution for underground garages in the lower mainland. We have just added to our “Low Boy” fleet to ensure that when you call, we can have the right equipment to your garage to address the problem. The Low Boy has a very short profile which means it can access your drain or catch basin in your low ceiling underground garage better than traditional vacuum trucks. More efficient means less time on site – the job is done faster and better. Whether your low clearance challenge is in Vancouver, Aldergrove, Surrey, Langley, Buranby, New Westminster, Delta or White rock, EdenFlo provides scheduled maintenance service for your parkade drainage needs. Don’t wait until you have a back up that leads to customer issues and lost revenue. Now is the time to book your drain cleaning service. 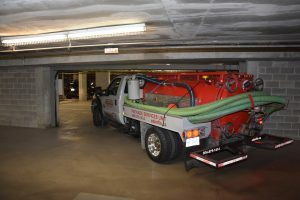 This entry was posted in Parking Garage Drain Cleaning and tagged best parkade drain cleaning vancouver, drain cleaning service vancouver, low ceiling drain cleaning, low clearance drain cleaning, low clearance drain cleaning Aldergrove, Low clearance drain cleaning Burnaby, Low clearance drain cleaning Delta, low clearance drain cleaning Langley, low clearance drain cleaning New Westminster, low clearance drain cleaning Surrey, low clearance drain cleaning vancouver, Low clearance drain cleaning White rock, underground parking drain cleaning on October 29, 2017 by Edenflo.